name: inverse layout: true class: middle, inverse --- # Social coding and open software Text is free to share and remix under [CC-BY-SA-4.0](https://creativecommons.org/licenses/by-sa/4.0/). Authors: - Radovan Bast - Richard Darst - Sabry Razick - Jyry Suvilehto With contributions from: - Anne Fouilloux - Oxana Smirnova --- layout: false # Plan for this talk .left-column[ ### - Software you create, matters ### - When can you take from others? ### - How can you give to others? ### - How to grow a community around your code ### - ... and how does this relate to CodeRefinery? ] .right-column[ Things .emph[go in], things .emph[come out]. If you want to build on others, you have to care about both directions. ] --- ## Software matters in research .emph[**Data** is part of research output] - Funding agencies often ask for a data management plan .emph[**Software** is part of research output] - Simulations which generate data - Control software for instruments - Post-processing of measurements - Data processing - Portals and apps - Spreadsheets - Scripts and tools which produce graphs and compute statistics Curiosity: Not too many projects consider a software management plan **yet**. Software development should consider .emph[FAIR principles, ideally from the start]. --- ## FAIR principles The FAIR Guiding Principles for scientific **data** management and stewardship (https://www.nature.com/articles/sdata201618): - To be .emph[**F**indable] - To be .emph[**A**ccessible] - To be .emph[**I**nteroperable] - To be .emph[**R**eusable] For a discussion of FAIR in the context of software, see https://softdev4research.github.io/4OSS-lesson/. --- ## Sharing is caring ### What are the benefits of sharing software? - Easier to find and reproduce (.emph[scientific reproducibility]) - More trustworthy: others can verify correctness and find and report bugs - Enables others to build on top of your code (derivative work, .emph[provided the license allows it]) - Others can submit features/improvements - Others can fix bugs - Many tools and apps are free for open source ([GitHub](https://github.com), [Travis CI](https://travis-ci.org), [Appveyor](https://www.appveyor.com), [Read the Docs](https://readthedocs.org)) - Good for your CV: you can show what you have built ... can you think of reasons not to share? --- ## Sharing is scary ### Why do some researchers prefer not to share? - Fear of being scooped - Exposes possibly "ugly code" - Others may find bugs - Others may require support and ask too many questions - Fear of losing control over the direction of the project - "Bad" derivative projects may appear - fear that this will harm the reputation ... we will discuss these in this talk and during this week. --- - Fear of being scooped > .remark[Very unlikely that others will understand your code and publish before you without involving you in a collaboration. Sharing is a form of publishing.] - Exposes possibly "ugly code" > .remark[In practice almost nobody will judge the quality of your code.] - Others may find bugs > .remark[Isn't this good? Would you not like to use a code which gives people the chance to locate bugs?] - Others may require support and ask too many questions > .remark[More about this later.] - Fear of losing control over the direction of the project > .remark[Open source does not mean everybody can change **your version**.] - "Bad" derivative projects may appear > .remark[It will be clear which is the official version.] --- ## Derivative work - If you build on something, you form a **derivative work** - Then, the original creator may have rights to what you make - The whole point of this talk is to make sure that .emph[you can make derivative works] and .emph[others can make derivative works from you] --- ## Derivative work examples ### Is a derivative work - Download some code from a website and add on to it - Download some code and use a function in your code - Changing the code - Extending the code - Completely rewriting the code - Rewriting the code to a different programming language ### Typically not derivative work - Linking to libraries (static or dynamic), plug-ins, and drivers - Clean room design - You read a paper, understand algorithm, write own code --- ## Why could allowing derivative work be good for you as researcher? - .emph[Quality] control: groups depending on your code will find bugs. - More applications. - Globally probably more papers (.emph[more impact]). - If you make your code citeable, you can measure this impact and use this in grant applications. - Long-term probably also .emph[more papers] for you: new collaborations and projects. - Groups depending on your code will not want your code to disappear: they might .emph[support you], send improvements, and share maintenance load. 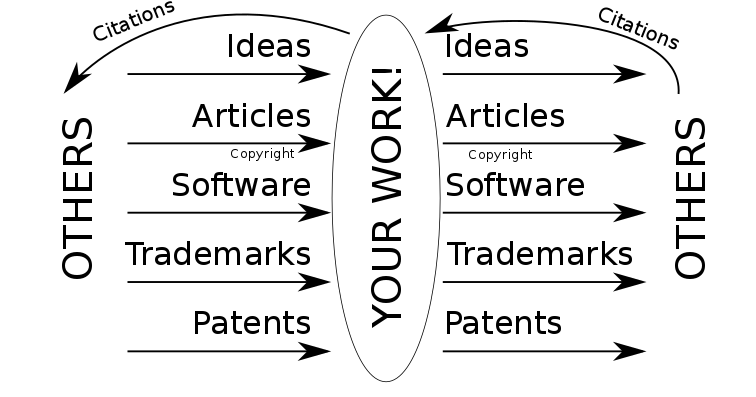 --- ## Types of intellectual property (IP) - Created automatically in certain circumstances (copyright) - Registered after the fact in other cases (patents) - Does not allow you to do something: allows you to prevent others from doing something. - Understanding IP is important for social coding. Next slides: **Types of IP** and **When can you use it? ** --- ## Copyright What: - Protects creative expression - Automatically created - **Derivative works** usually inherits copyright of the thing derived - Time frame: essentially forever (lifetime + X years) When can you use: - When there is a license saying you can - Limited other cases (private use, fair use: context dependent) - In practice: people do many things, but then can't share their output if copyright Applicable to: software, writing, graphics, photos, certain datasets, this presentation. *Very broad. * --- ## Patents - Protects a *novel, non-obvious, technical invention*. - Must be registered *before revealed*. Registration involves full disclosure. - Can an algorithm be patented? Software? - Patents are a minefield and often used to troll ("patent troll"). When you can use: - Get expert advice. Examples: RSA cryptography (possibly good), Amazon 1-click (probably bad). --- ## Trademarks What: - Protects a name/brand from impersonation. When you can use: - To factually refer to something. - In general, just don't use an existing name in order to deceive. Examples: "Mozilla Firefox", "Apple", "Linux". --- ## Datasets What: - The EU has a database directive which restricts data mining on databases. - Has a somewhat similar effect to copyright, because copyright would not apply to data mining. - A good license also gives rights to data mine. So not a major concern. When you can use datasets: - The license allows - Your country has exceptions for research - The data doesn't come from the EU --- ## Ideas .emph[Are not be protected by IP]: you can always use them. Example: You read a paper, understand the algorithm, and write your own software to do it. --- ## Social coding: what is relevant to scientists? - You come up with .emph[ideas] - Ideas are published in .emph[papers] - Papers might have limited access, but .emph[anyone can use the ideas] in them - Your goal is to get citations for your paper by people using or improving your ideas - Your .emph[software] may implement an idea in your paper - For your ideas to be used, software should be usable - If people can use or .emph[improve your software] they can more easily use your ideas - If people cannot reuse and extend your software, .emph[its impact will be limited] The middle part of this talk is about how to allow others to use your .emph[copyright (and data)] --- ## Exercises (1/2) 1. Contrast Matlab vs Octave from a derivative work, intellectual property, and open science standpoint. 3. Do you form derivative works of your groupmates' work? Colleagues who came before you? What have you done that isn't a derivative work? 2. Try to trace and think of the derivative work history of this lesson. How many inputs are there? What happens if you think of more than copyright? --- ## Software licensing: What is free software? ### Free as in beer or free as in speech? (Emoji icons provided free by [EmojiOne](https://www.emojione.com)) ### Software freedom Is the freedom to ... - ... run the software for .emph[any purpose] - ... .emph[study] how the software works and to adapt it to your needs - ... .emph[redistribute] copies of the software - ... .emph[improve] the software and distribute your improvements to the public --- ## What is free software? ### Software freedom and research Is the freedom to ... - ... run the software for any purpose: .emph[new applications] - ... study how the software works and to adapt it to your needs: .emph[new applications, less reinventing wheels] - ... redistribute copies of the software: .emph[more users, more citations] - ... improve the software and distribute your improvements to the public: .emph[fix bugs, new science] ### Typical confusion - Free software does not mean that software is for free - Open source license does not mean you need to share everything immediately - Open source does not mean public domain: software in the public domain has no owner - Open source does not mean non-commercial: plenty of companies produce and support it --- ## In practice you need to choose a license - Code without license is not useful for reuse or derivative work. - Example why choice of license matters, X vs. SunView: https://lwn.net/Articles/26608/ ## Software licensing and open source explained with cakes - Imagine you compose a recipe for a really tasty cake (a great idea). - In regular intervals you distribute cakes (release binaries). - Your family and friends love it. - But you can only bake so many. (cake emoji licensed under CC-BY-SA-4.0, attribution: [EmojiOne](https://www.emojione.com)) --- ## Possible outcomes 0/4: closed ### Closed source (recipe never released) - Your cake is celebrated by The New Yorker magazine. - People will have difficulties to reproduce your celebrated recipe. - Nobody else will improve your recipe. - Bad copycats might appear, you don't get any credit. - Fewer tasty cakes will get consumed. --- ## A friend tells you: why not distribute the recipe? - Put your recipe on GitHub. - Start the OpenCake organization. - Get feedback / start a mailing list. - More people will be able to enjoy the cake (.emph[increase impact]). - Maybe somebody will find ways to improve the recipe. - Everyone will know that it was your idea even though somebody else bakes it. --- ## Mrs. X (running a famous restaurant) finds your cake recipe on GitHub - The chef tries it and it is great. - The chef suggests improvements (derivative work): - It becomes part of the restaurant menu. - Or does it? .emph[Depends on your license!] --- ## Possible outcomes 1/4: custom ### No license or custom license - No restaurant chef will touch it: too much hassle to employ a lawyer to be sure that the cake can be served to customers. - But maybe they will bake it and eat it and not distribute it and that is OK ("fair use" provision permits the making of copies for own use). --- ## Possible outcomes 2/4: permissive ### License: MIT or Apache or BSD-2 - It is OK to use the recipe and sell the cake. - It is OK to not share the improved recipe. - If somebody becomes sick, it is not the fault of the OpenCake organization (limit of liability). - You may not get the improvements back to use yourself. ### License: BSD-3 - In addition to the above it is understood that the updated recipe are not endorsed by the OpenCake organization. --- ## Possible outcomes 3/4: share-alike ### License: GNU Lesser GPL (LGPL) - The famous restaurant has to share only the improved cake recipe but can keep the rest of the menu closed. - The restaurant guests have to be able to exchange the cake from the menu by improved cakes from other restaurants (dynamic relinking). ### License: Mozilla Public License v2.0 - Like LGPL but do not require that the modified cake can be exchanged by the restaurant guest. --- ## Possible outcomes 4/4: viral ### License: GNU GPL or GNU Affero GPL - If the cake is a part of the menu, the famous restaurant has to .emph[share the recipes of the entire menu]. - You can use their improved recipe and improve it further: - Other restaurants can then reuse and improve the full menu and the hope is that we will all eat better food. - You support open restaurants. You can use everything they do, too. --- ## What outcomes did we have? ### 1. Custom/closed - **Derivative work typically not possible**: others have to reimplement the wheel ### 2. Permissive - You may lose access to **derivative work** - Attractive for companies with proprietary software ### 3. Share-alike - You can reuse **derivative work** - Compatible with proprietary software ### 4. Viral - .emph[You always have access if someone improves and re-shares] - Not attractive for companies with proprietary software --- ## Who owns the copyright for software you write? (1/2) - You? Your university? - .emph[Intellectual property depends on the country and the employer!] - So-called works made for hire. ### If you own your software: - You can change the license. - You can dual-license (e.g. GPL for anyone, but you can pay for commercial non-GPL). --- ## Who owns the copyright for software you write? (2/2) ### If you accept contributions (pull requests), you may not be the only owner anymore! - Clarify licensing strategy .emph[before] - otherwise you won't have all rights to your code. ### If you do not own your software, you can: - Request open-sourcing directly (preserves your rights!). - Request a transfer of ownership (check with your university). --- ## Practical recommendations ### Starting and contributing to a project - .emph[You cannot ignore licensing]: default is "no one can make copies or derivative works". - License your code .emph[very early] in the project: ideally develop publicly accessible open source code .emph[from day one]. - Take an [OSI](https://opensource.org/licenses)-approved license: makes it easier to evaluate [compatibility](https://en.wikipedia.org/wiki/License_compatibility). - .emph[Do not use custom licenses] for open source: compatibility not clear. - Open source your code to make sure you are not locked out of your own code once you change affiliation. ### Licensing - Add a `LICENSE` file to your repository (GitHub understands it): - Use GitHub web to add file named `LICENSE` and it helps you select! - You should check that GitHub can automatically detect the license. - License text, slides, images, and supporting information under a [Creative Commons license](https://creativecommons.org/licenses/), and get a DOI using [Zenodo](https://zenodo.org) or [Figshare](https://figshare.com). --- ## Social coding - Licensing is one thing... but will anyone ever use it? - Too much use is rarely a problem. What if you want people to use your work and .emph[make you the leader?] In the CodeRefinery workshop we will discuss strategies to make your software more usable by others (and you six months from now!). Here we summarize what is to come... --- ## Version control - Minimum requirement to share software with others. - The basis of everything else. Somewhat related: project management/issue system: - Included as part of GitLab/GitHub/etc. - Allows communication, issue tracking, and community. CodeRefinery lessons: - https://coderefinery.github.io/git-refresher/ - https://coderefinery.github.io/git-solo/ - https://coderefinery.github.io/git-collaborative/ --- ## Reproducibility and build systems - Can someone duplicate your results easily? - Can someone actually install your software and use it? - If they can't, there is a high barrier to use. CodeRefinery lesson: [Reproducible research](https://coderefinery.github.io/reproducible-research/) --- ## Software testing - How can someone modify your software and make sure they don't break it? - Software tests are verification that your software works the right way before and after. - Software tests allow others (.emph[and you!]) to modify and improve software with more confidence. CodeRefinery lesson: [Automated testing](https://coderefinery.github.io/testing/) --- ## Documentation - Code alone is often not enough. - Is there a more modern solution than README files? - Are there clear contributor instructions? How to get started, how to submit first pull request, how to test, etc? CodeRefinery lesson: [Code documentation](https://coderefinery.github.io/documentation/) --- ## Does this look like a serious project? ### As a .emph[developer] or .emph[user] what are you looking at when discovering a new package? These are common things to check: - Date of last code change .remark[... is the project abandoned?] - Release history - Versioning .remark[... will it be painful to upgrade?] - Number of open pull requests and issues - are they followed-up? - Installation instructions .remark[... will it be difficult to get it running?] - Example .remark[... will it be difficult to get started?] - License .remark[... am I allowed to use it?] --- ## Communication and atmosphere - Do you welcome people to your project? - Do you give credit? - Do you respond to issues and pull requests? - Do you have a Code of Conduct? https://www.contributor-covenant.org - Openness and transparency - Document whether/how/where you want to be asked questions - Chat or mailing list - If the project grows, agree on a decision process for controversial changes --- ## Software citation - Get a [DOI](https://en.wikipedia.org/wiki/Digital_object_identifier) using [Zenodo](https://zenodo.org). - Open source license can't demand citation, but it is required by science ethics anyway. - Make it as easy as possible! Clearly say what you want cited. - Make it easy for scripts and tools, use the [Citation file format](https://citation-file-format.github.io): ``` cff-version: 1.0.3 message: If you use numgrid, please cite it as below. authors: - family-names: Bast given-names: Radovan title: numgrid version: 1.0.2 doi: 10.5281/zenodo.1470277 date-released: 2018-10-24 ``` ### Publishing papers about software - [The Journal of Open Source Software](https://joss.theoj.org/about) - [In which journals should I publish my software? ](https://www.software.ac.uk/resources/guides/which-journals-should-i-publish-my-software) --- ## Conclusions and discussion - License your code .emph[very early] in the project: ideally develop publicly accessible open source code .emph[from day one]. - Make it easy to cite your code ([Zenodo](https://zenodo.org)) - Please help us to improve this material: https://github.com/coderefinery/social-coding ### Where to place your code - https://github.com: public (unlimited) or private (up to 3 collaborators or unlimited educational) repositories - https://gitlab.com: public or private repositories - https://source.coderefinery.org: public or private repositories ### Great resources - http://rkd.zgib.net/scicomp/open-science/open-science.html - https://softdev4research.github.io/4OSS-lesson/ - https://softdev4research.github.io/recommendations/ --- ## Good resources for software licensing - https://www.software.ac.uk/choosing-open-source-licence - https://choosealicense.com (can send automatic pull request to your GitHub repo) - http://oss-watch.ac.uk/resources/ipr - http://www.rosenlaw.com/oslbook.htm - http://depth-first.com/articles/2006/12/29/dispelling-open-source-confusion-an-introduction-to-licenses/ - http://blog.milkingthegnu.org/2008/03/10-answers-for.html - http://www.oreilly.com/openbook/osfreesoft/ - https://tldrlegal.com/ - https://hintjens.gitbooks.io/social-architecture/content/chapter2.html - https://users.aalto.fi/~darstr1/cheatsheets/ipr-cheatsheet.pdf --- ## Exercises (2/2) 1. What is the StackOverflow license for code you copy and paste? 2. Name some software or work you have created that should be non-open, licensed permissively, and licensed virally. 3. What can you do with CodeRefinery lessons? present them? copy them? modify them and present them? send changes back to us? find them in 20 years? present them and call them a CodeRefinery workshop? 4. (advanced) Find the package "Omnet++" and study its license. Compare to the GPL. What do you think?